China and Uruguay yesterday signed trade and investment pacts as part of joint efforts to tide over the global financial crisis. Commercial Minister Chen Deming and Uruguayan Foreign Minister Gonzalo Fernandez signed two memorandums on trade and investment at the Great Hall of the People in Beijing. Under the pacts, Uruguay recognized China's full market economy status, which will help China better protect its rights in case of anti-dumping charges. No further details were released to the press. 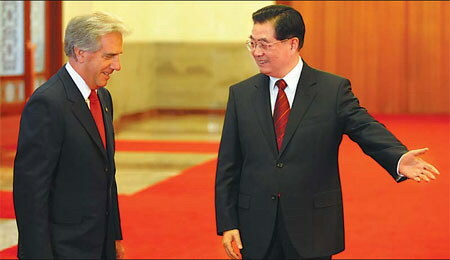 President Hu Jintao and Tabare Vazquez, his Uruguayan counterpart, officiated at the signing ceremony after an hour-long talk. "My visit to China is of deep political significance," Vazquez said at the beginning of his meeting with Hu. "We believe in the power of politics, and believe we can enable our people to enjoy a very good life through political achievements," the Uruguayan leader said. China is Uruguay's third largest trading partner. Uruguayan newspaper El Pais said on March 19, the day Vazquez departed for China, that the visit aims to expand trade with China amid the financial crisis. According to Uruguay's official figures, its exports dropped 20.2 percent year-on-year last month, a decline for a fourth month in a row. It is reported that the Uruguayan unemployment rate among youngsters reached 20 percent at the end of last year. During the meeting, Vazquez stressed the need to establish a new international financial system and hoped the G20 summit in London next month would help developing countries cope with the economic woe. Hu told Vazquez China pays great attention to the G20 summit and will push for "positive results" at the summit. High-ranking officials from the two countries yesterday also signed deals on technology, water resources, sports and collaboration between China's central television station and Uruguay's state TV station. More deals are expected to be inked during Vazquez's six-day visit to the country, which started on Saturday. Today Vazquez will lead his delegation consisting more than 80 entrepreneurs and several ministers to visit China Council for the Promotion of International Trade, and attend a meeting of entrepreneurs from the two sides. There, according to the agenda announced by the Uruguayan government, Uruguayan Economy and Finance Minister Alvaro Garca will introduce "Ronda Uruguay 2009" plan, which invites world's investors to explore oil and gas in Uruguayan seas. Vazquez would meet top legislator Wu Bangguo and Premier Wen Jiabao and then fly to the economic hub of Shanghai today, where he will sign the contract of Uruguay's participation at the 2010 World Expo. Wang Yizhou, at the Chinese Academy of Social Sciences, said earlier this month that some Latin American countries hard hit by the financial crisis are willing to strengthen cooperation with China.